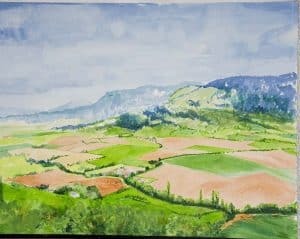 Panting Landscapes in Southern France, the Midi-Pyrenees to be exact is a study in greens. The spring colours are still on the hills and fields. The mountains are always present, layering into a blue haze in the distance. I have not been painting landscapes for some time and the experience here is quite wonderful.